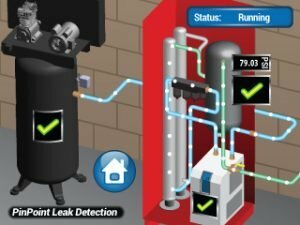 Sprinkler pipe corrosion leads to costly facility damage from pinhole leaks and catastrophic losses when compromised sprinkler systems are rendered inoperable during a fire. 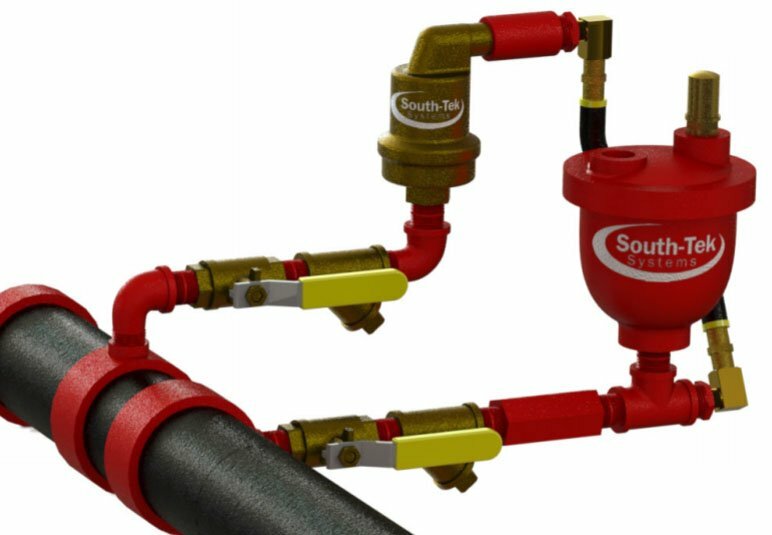 Protect and extend the life of your fire sprinkler piping with South-Tek Systems corrosion inhibiting solutions. 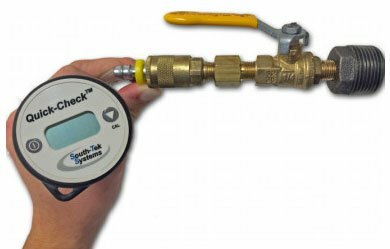 South-Tek Systems understands the science behind corrosion and has always been committed to ongoing testing, having provided the Fire Protection Industry with the first and longest running corrosion study of sprinkler piping exposed to both compressed air and nitrogen gas. 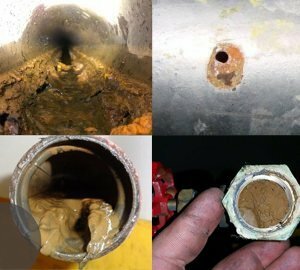 Advise on sprinkler pipe corrosion and manufacture the most efficient and cost effective engineered corrosion solutions on the market. As the only provider of dual-bed pressure swing absorption (PSA) nitrogen separation technology to the Fire Protection Industry, South-Tek’s nitrogen generators yield an efficient 2:1 air to nitrogen ratio versus the 3:1 ratio of competing membrane systems. Requiring less feed air to generate the same amount of nitrogen and allowing the feed air compressor to run at a lower pressure and temperature than it would in a membrane system ultimately maximizes the life of the feed air compressor and other integral components. PSA technology is also longer lasting—to the tune of 20+ years. 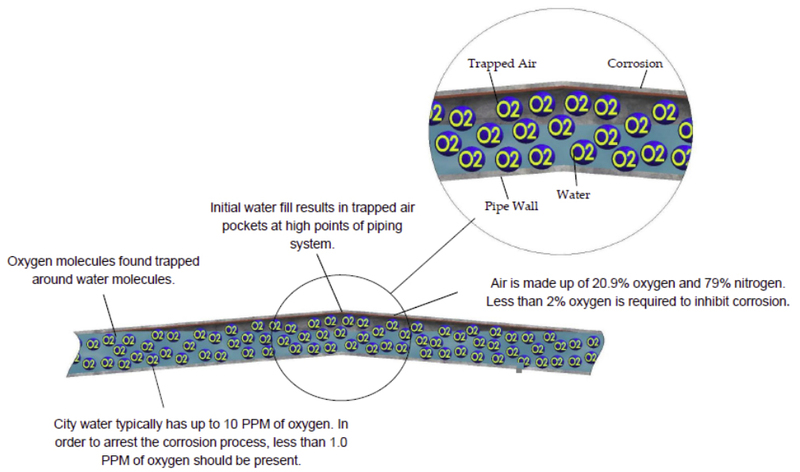 In a PSA system, CMS material is utilized to extract oxygen from the air under pressure and capture nitrogen. It’s proven to provide 98%+ purity for longer as it does not break down nearly as quickly as the hollow fibers do within a membrane. 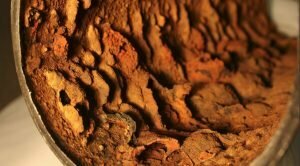 Sprinkler pipe corrosion is a serious threat for organizations that rely on wet fire sprinkler systems to protect their facilities. 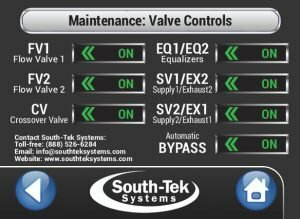 It leads to costly and extensive pipe repairs that can shut down or delay production in a manufacturing setting, reduce usable space in garage and warehouse settings, and force relocation of tenants or patients in residential and hospital settings. 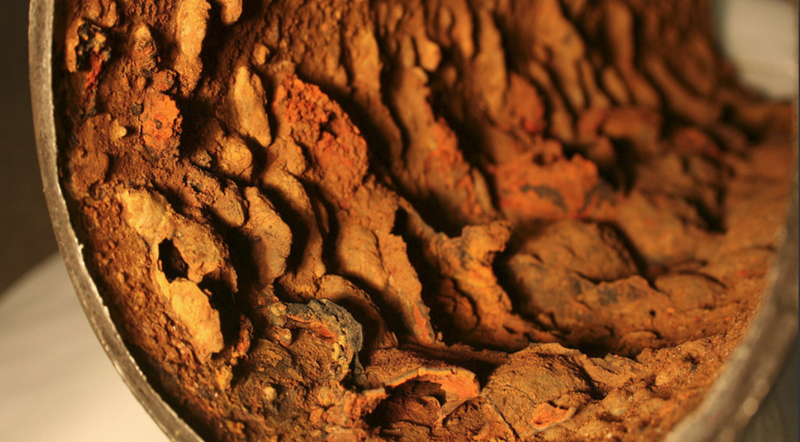 Corrosion leads to the formation of localized pinholes and the resulting sprinkler pipe leaks can cause catastrophic property and equipment damage in facilities such as distribution centers and dormitories. 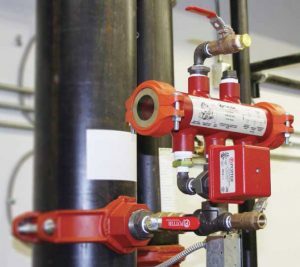 More importantly, internal corrosion can cause sprinkler head blockage, reduce flow rates, and render fire protection systems completely inoperable in the event of a fire – leading to loss of life and property. 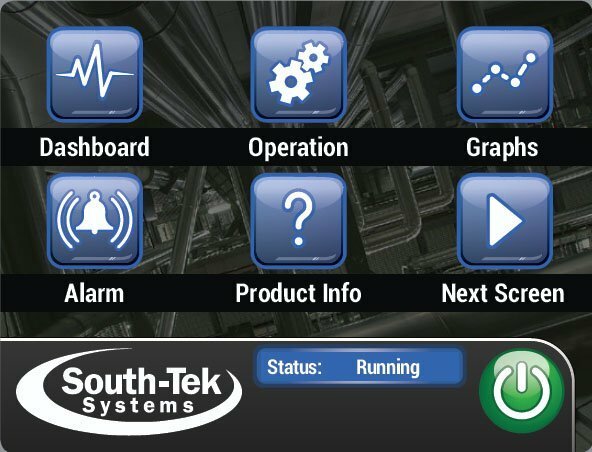 South-Tek Systems’ full suite of wet system corrosion solutions offers the right level of corrosion protection for any facility. The patent pending DeOx™ – Dual Vent O2-Release System™ provides baseline defense by helping to eliminate the corrosive air-water interface along the high points of the sprinkler pipe network. To further reduce the likelihood of electrochemical corrosion, we recommend combining the Dual Vent O2-Release System™ with the DeOx™ – N2-Inert System™. 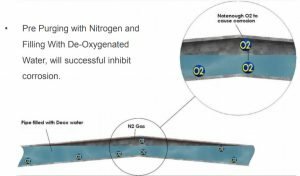 The N2-Inert System™ is designed to rapidly pre-fill any wet sprinkler system with ultra-pure nitrogen gas and effectively displace up to 99.5% of the oxygen from within the system. 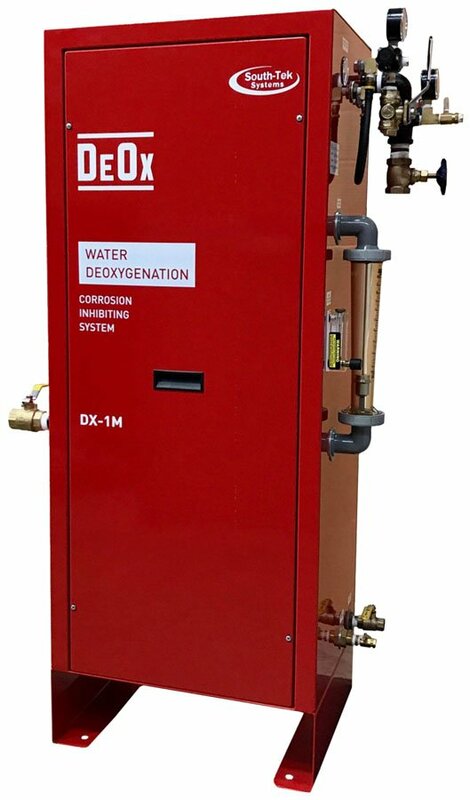 And for maximum corrosion protection, look no further than the Patented DeOx™ – Water DeOxygenation System™. 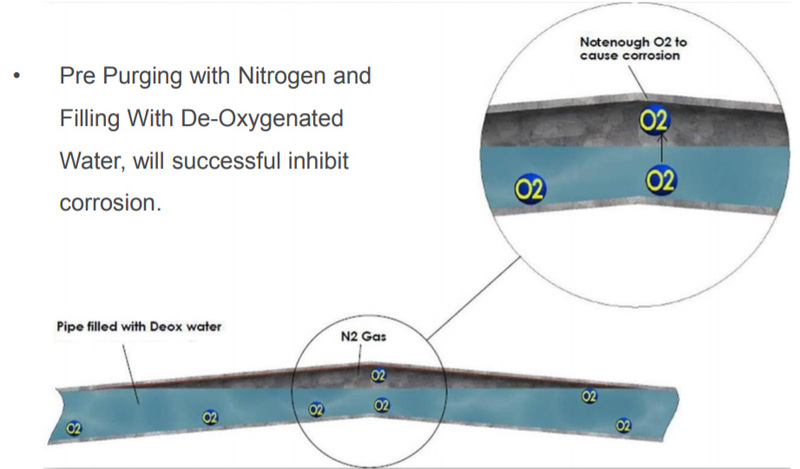 After employing N2-Inert™ technology to target the trapped oxygen at the high points of the piping network, the Water DeOxygenation System™ then removes the dissolved oxygen and harmful bacteria from the fill water prior to it entering the wet sprinkler piping. One O2-Release system recommended per high point of piping network to eliminate corrosive air-water interface at point of installation. 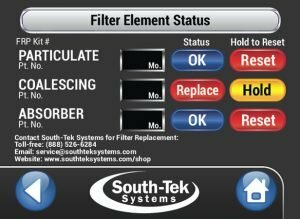 South-Tek Systems designs and manufactures the N2-Blast® – Corrosion Inhibiting System, which effectively arrests electrochemical, galvanic, and micro-biologically influenced corrosion (MIC) by introducing up to 99.9995% pure nitrogen gas into the dry or preaction sprinkler system. 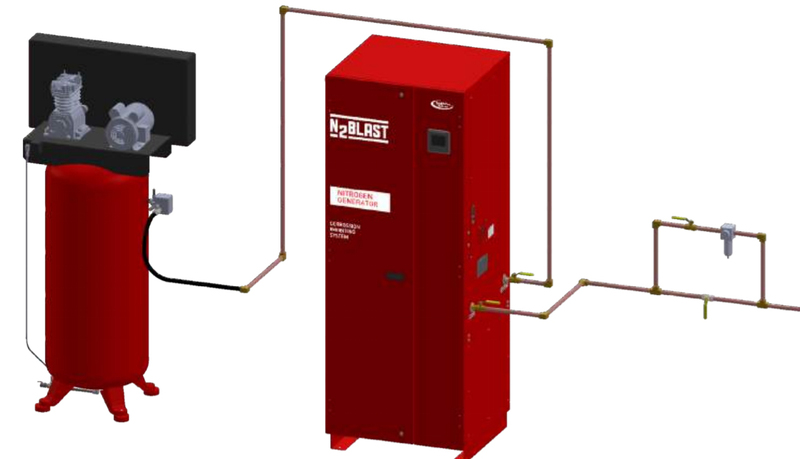 The N2-Blast® also prevents ice plugs by ensuring a -40°F to -70°F dew point within the sprinkler system. As high purity nitrogen gas enters the sprinkler piping, corrosive oxygen and moisture are displaced through the N2-Blast® – AutoPurge System®. 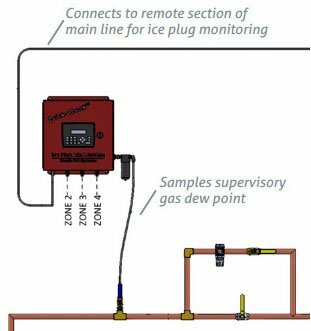 Long-term exposure tests are currently being conducted to compare the performance of black and galvanized steel sprinkler pipe in compressed air and nitrogen gas environments. The testing was started by South-Tek Systems and has been running continuously for more than a decade. 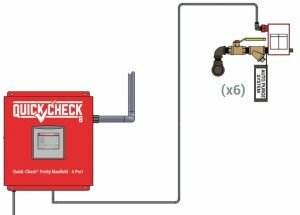 The test environment is comprised of half-filled Schedule 10 black and galvanized steel sprinkler pipe sections, which are individually subjected to either compressed air, 95% nitrogen, or 98% nitrogen supervision. Nitrogen eliminates the Electrochemical Potential – Oxygen (2), therefore the equation is not complete and corrosion is inhibited. 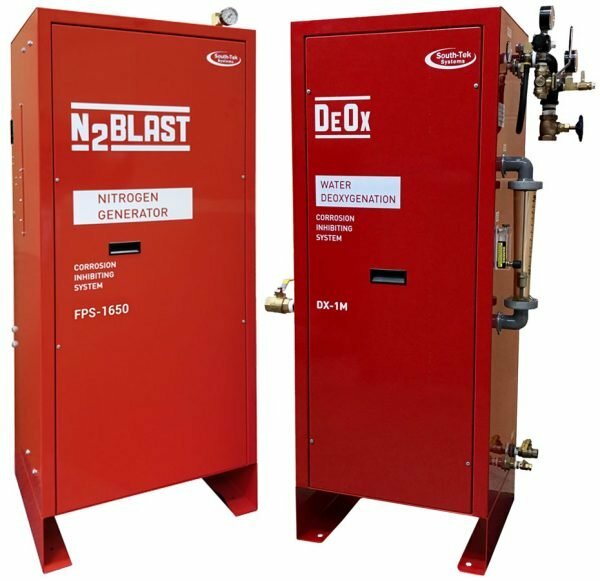 The N2-Blast® generates and introduces 98%+ pure nitrogen into the dry or pre-action fire protection system. 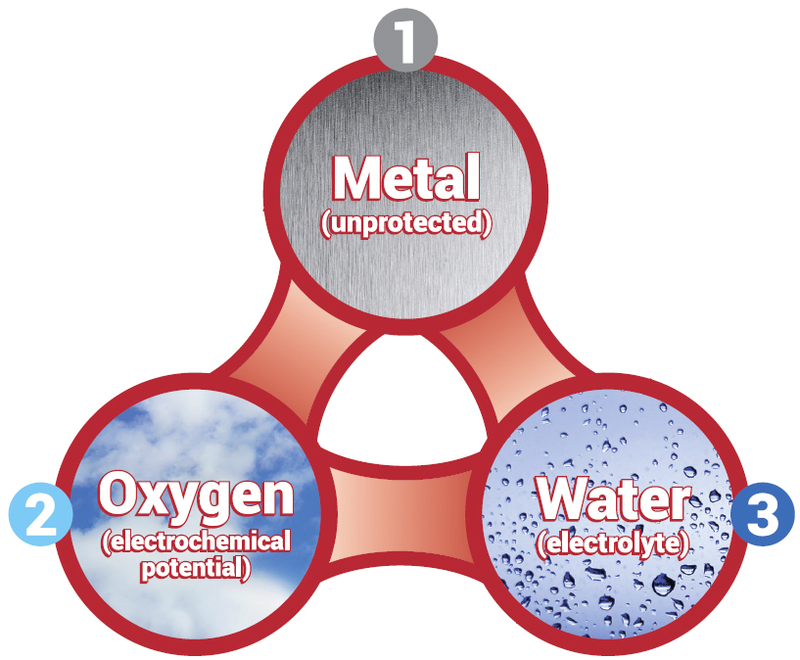 In doing so, oxygen, a key contributor to corrosion, is displaced from the piping through the AutoPurge System®. The N2-Blast® effectively inhibits electrochemical, galvanic and micro-biologically influenced corrosion (MIC), as well as freeze-ups and ice plugs. Wall-mount units available in 500 gallon or 900 gallon FPS sprinkler pipe capacity. 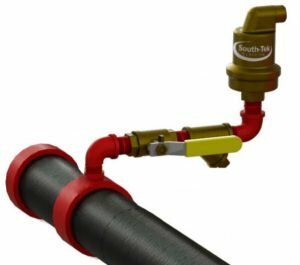 Skid-mount units available from 1,650 gallons to 22,500 gallons FPS sprinkler pipe capacity. 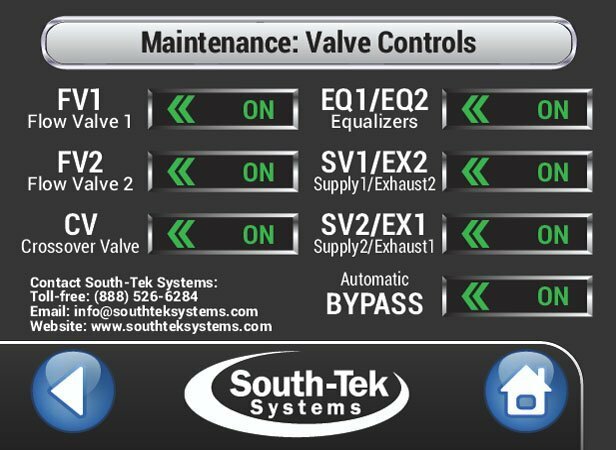 South-Tek Systems developed the patented BlastOff® series of alarms to proactively ensure the longevity of not only the FPS, but the nitrogen generation system itself. 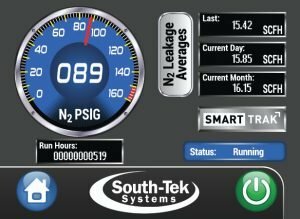 If there is a significant leak downstream or equipment malfunction that causes the N2-Blast® to run for nine (9) consecutive hours, the BlastOff® I – Leak Detection System will alarm so that the issue can be diagnosed proactively. 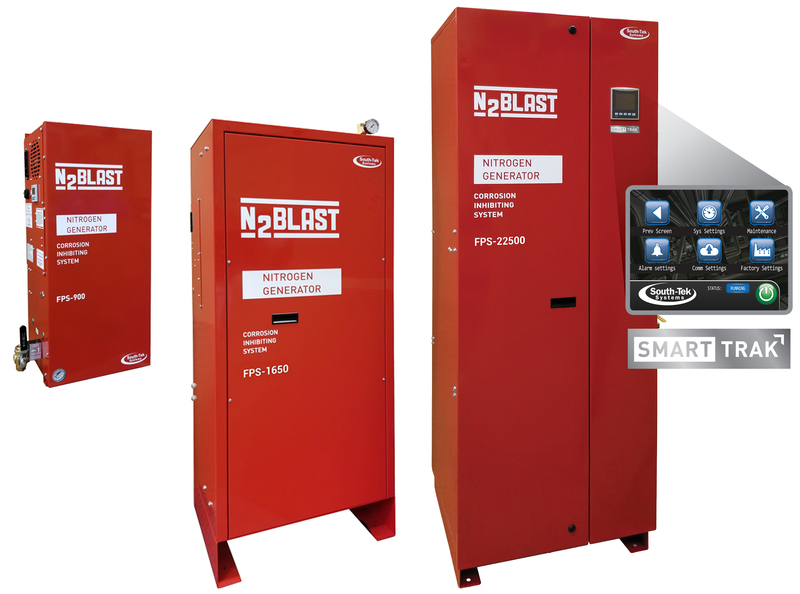 The BlastOff® II – Air Bypass Alarm safeguards against an install error or a technician inadvertently leaving the nitrogen generator offline. The BlastOff® III – Early Warning System alarms if there is an issue with the equipment and/or pinpoints the location of a significant leak upstream, within, or downstream of the nitrogen generator. The BlastOff® IV – Onboard Purity Alarm (trouble alarm) monitors the purity of the nitrogen going into the fire protection system. Trouble alarm if purity drops below 98%. 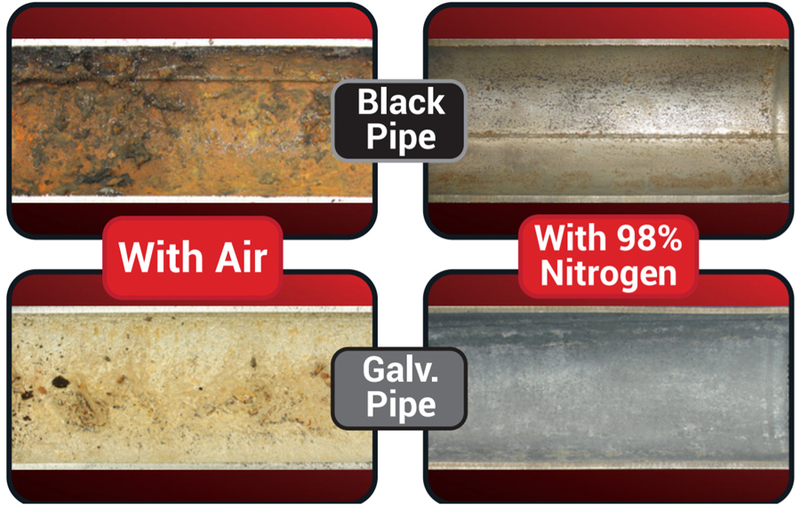 High purity nitrogen must be equally distributed throughout the entire FPS piping system in order to effectively inhibit corrosion. 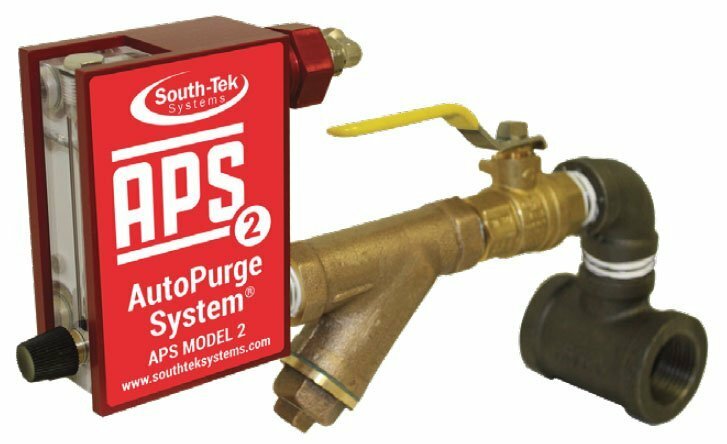 The patented AutoPurge System® provides a low volume, constant purge of nitrogen throughout each FPS system. The rate in which gas is purged from the FPS is within NFPA guidelines and allows breathing to occur within the sprinkler piping. 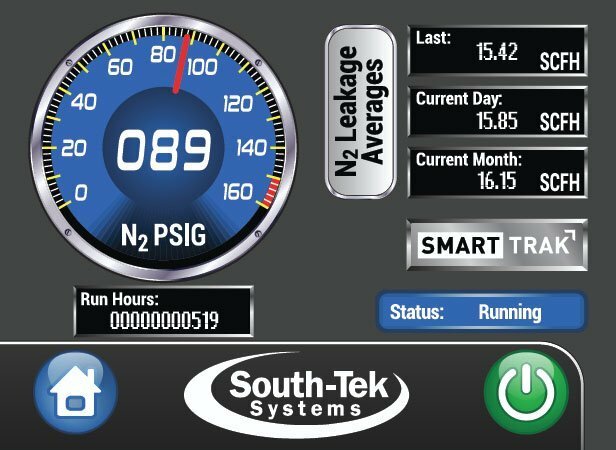 The AutoPurge System® also provides a point in which the nitrogen purity concentration can be monitored downstream of the nitrogen generator. 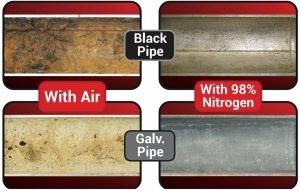 Computational Fluid Dynamics (CFD) modeling proves that this is the most effective way to ensure that high purity nitrogen reaches all branches of the fire protection system. 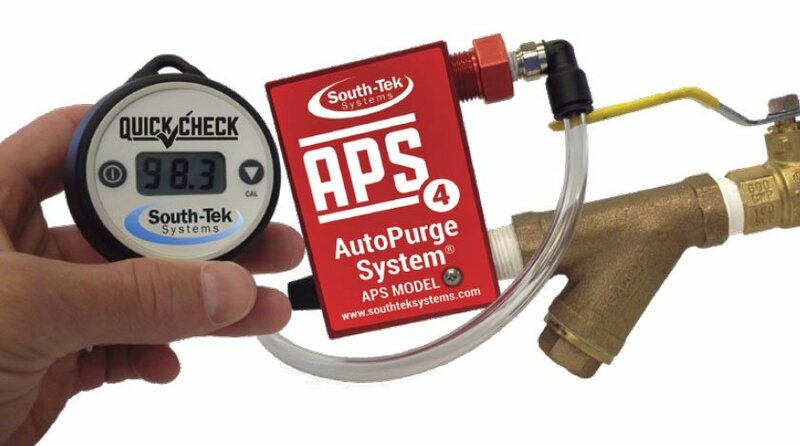 Install one AutoPurge System® per zone at an area in which water will not collect. 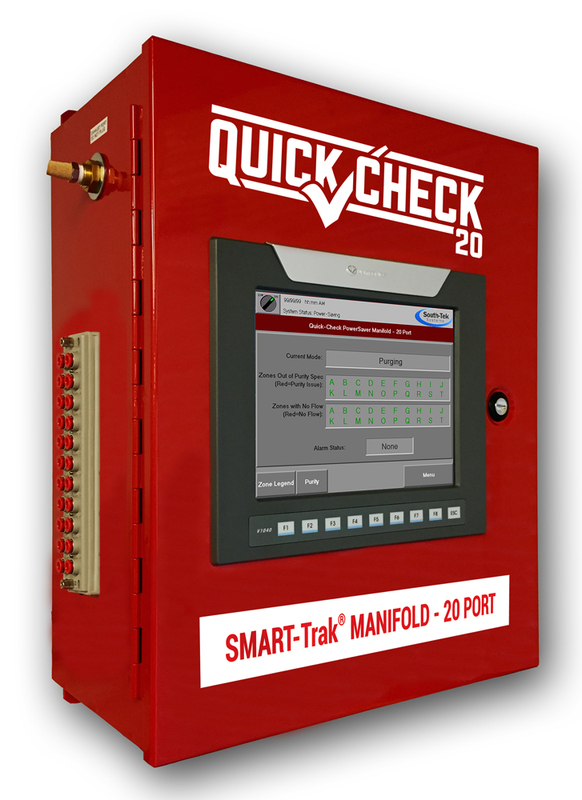 The Quick-Check® – Purity Manifold allows you to remotely monitor the nitrogen purity within each zone of the fire protection system. Each AutoPurge System® can be connected to the Purity Manifold with 1/4” plenum-rated tubing. 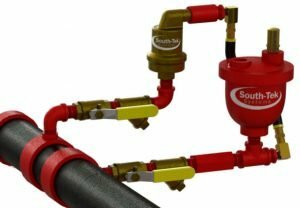 The Purity Manifold monitors nitrogen purity within each zone during a “sampling phase”, once per day. 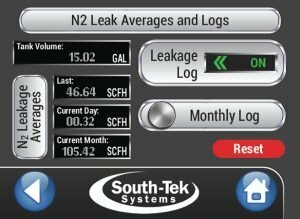 At the end of the sampling phase, the Purity Manifold stores the achieved nitrogen purity into memory and displays the results on its screen. If the zone’s purity meets specification, the AutoPurge System® will remain closed (not purging) until the next sampling phase. If purity does not meet specification, the AutoPurge System® will remain in the “open” position and continue its purge until the next sampling phase (nitrogen generator increases the N2 level within the zone until the nitrogen purity specification is met).